Bless Buena Vista Home Video. Two years ago, they released a trio of movies by Japanese Animator Hayao Miyazaki. One was the Oscar-winning Spirited Away, but the other two were lesser-known titles that would have been hard find on video. Last year they released another three-pack, two by Miyazaki and one by another director at Studio Ghibli. Now they’ve dug even deeper to release DVDs of the Studio Ghibli films My Neighbors the Yamadas and Pom Poko, both by director Isao Takahata. Cross The Simpsons with Family Guy. Tone it down a little, and add some of the charm from the Charlie Brown TV specials. Set it in modern Tokyo. Finally, animate the film using pencil and watercolor, and you have some idea of what My Neighbors the Yamadas is like. Unlike most of the other Studio Ghibli releases, Yamadas is episodic. There is no epic plot. In fact, there is very little plot of any kind. Instead, Takahata offers us sketches of daily life in the Yamada family. The young daughter gets lost at the mall. Her older brother tries to get the attention of a girl at school. The husband and wife are locked in a never-ending passive-aggressive battle for tiny victories. And grandma Yamada dotes and scolds as her moods dictate. The humor is light and observant, and almost always justified by the well-rounded characters. You can watch The Yamadas in dubbed English (you might recognize Jim Belushi, Molly Shannon, Daryl Sabara, or Tress MacNeille), or in the original spoken Japanese with English subtitles. Switching back and forth, I found there to be more humor in the Japanese version. “Haven’t you ever heard of genetics?” isn’t nearly as funny as “Don’t you know about stamens and pistils?” Make sure you turn on the “English” subtitles, and not “English for the Hearing Impaired” subtitles, which are merely a transcript of the English dub. In spite of the relatively simple visual style, the animation is very sophisticated. Takahata uses lots of moving “cameras.” I assume he was aided by a computer, but it’s often breathtaking to see such a simple sketch come to life. He also has an amazing sense of momentum. In a bus, the handholds swing back and forth with the motion of the vehicle. When father steps on the brakes in the family car, the characters are thrown forward. The pencil-and-watercolor look is deceptively simple. If you’ve seen Miyazaki’s movies, Pom Poko, also directed by Takahata, will look much more familiar. And yet of all the Studio Ghibli movies, it may be the most foreign. The story is about a clan of raccoons who are threatened by the encroachment of civilization. These raccoons are shapeshifters (apparently a Japanese cultural thing). They use this ability to try to fight the oncoming tide of humanity. We’ve seen the broader story in the West (Bambi, for one); what makes Pom Poko so foreign are the little things. For instance, the male raccoons are, if not anatomically correct, well, they’re two-thirds of the way there. They proudly sing about their balls swinging in the wind, and one even uses his scrotum to cause a traffic accident. Switching over to the English dub version, I heard the raccoons talking about their “pouches.” I guess in America, raccoons are marsupials. And as for the macho songs, well, in the English dub, the producers completely changed the lyrics. Inexplicably, the raccoons sometimes take on a third shape (near humans, they look like real raccoons, but usually they look like cartoon gophers). This third shape is a pure, unadorned, teddy-bear shape that the raccoons take on when they break out into celebration. I felt like I was missing something, as though some important cultural knowledge was needed to really interpret the movie. The visual climax of the film comes when the best shapeshifters parade down the human streets in all sorts of fantastic, fantasmic forms. It’s the sort of mythical scene that makes Princess Mononoke and Nausicaa so good, and as strange as it is visually, it is more familiar than the subtle things that have to do with modern Japanese culture. Pom Poko comes as a two-disc set. As with the previous Miyazaki releases, the second disc repeats the movie but replaces the finished visuals with the storyboards. Disc one only has the movie, plus trailers and TV spots. 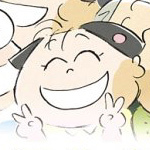 My Neighbors the Yamadas is only a one-disc DVD. As with previous releases, one of the extra features is called “Behind the Microphone,” featuring interviews with the American dubbers, who praise the material to the skies. This disc also has trailers and TV spots (some of which say “we hope to be finished with the film by release date”). The storyboards on this DVD are different. Instead of playing alongside the audio track, you have to step through them with Next and Previous buttons. Picture quality on both DVDs is excellent. Sound quality is flawless as well, but not as important or impressive. Both movies are presented in their original widescreen format. Both are encoded in Dolby Digital Surround Sound. Marty Mapes: Sure enough. It is a cultural thing. 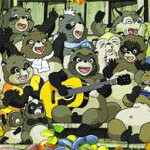 The Pom Poko are not Raccoons but "Tanuki" -- something I had never heard of in my Colorado upbringing.